An action at law, some years ago, in which the Newton Rural District Authority was engaged, resulted, after a protracted trial and great expense, in the decision that a certain old track, now known locally as the Right-of-Way, about a mile and a quarter in length, was an ancient road to which the public had full right of access. This road, marked in the Ordnance Survey, ‘Supposed British Road’, leads to a ford at the head of the Teign estuary which it has not been possible to use since the formation of the deep-water channel. The road from Penninn is open as far as Buckland Barton, but from the Barton to the river it is still closed to the public. It will, perhaps, be of interest to trace the road in each direction and to see that it is not only as old as the Roman invasion, but is probably an ancient thoroughfare, dating from before the dawn of history in the island. We shall find it in all conditions, from a state of complete alienation to private purposes to the full traffic of a principal highway. From the Teign ford, proceeding south-west through Buckland Barton, we reach Penninn. The marshy lands of the Aller stream, in earlier days more extensive than now, have to be passed at a convenient spot, and we cross the modern Torquay road just where an important estate boundary lies along the lower side of Penninn Nursery. From the gravel bank we cross to one side of the little Deerpark Hill. The construction of the Great Western Railway has made the exact spot uncertain. Nearly in front of us, across the old Kingskerswell road, we face the end of an old lane along the side of Blackball Plantation. There is also within the plantation evidence of an old track roughly parallel. We are led up the rise of Abbotskerswell Hill. Through gates in line we proceed from Stan Parks toward the village, having a deep packhorse track at the left of the made road. There is a steep descent with remains of cottages and narrow strips of garden once squatted on the wayside. The road into the valley is deep – many feet below the footpath. Crossing the small stream by the turning to the church we have a patch of wet meadow between us and the foot of Slade Lane. The village street (and bridge) causes a short detour. The rocky ascent of Slade Lane is the old way out of the valley on this west side. At the top there is a slight curve due to modern changes, but we follow directly on across the Denbury–Kingskerswell road at Gulland (or Gullan’s) Cross. Here we have evidence of age, for though the Denbury and Kingskerswell road is an old one, yet it makes a sudden turn to run for some yards along the ancient track we are following before resuming its original direction. The lane leads through a gate on to the open top of Gotemhill, the hedge on our left being continued right into the field. It is clearly seen that the hedge-wall at the gate closing the way is modern work. Directly across the hill we leave by a gate and are in a defined lane crossing others in a curiously oblique manner, and at ‘Causeway’ running into the course of the modern Totnes road, constructed under the Totnes Turnpike Act. The hedge at Causeway is seen to be precisely in line with the old track at Conniford Lane, south-west of Ipplepen, and the name itself points to a marked road of ancient origin. A deeply-worn track is by the side of the metalled road, and there are also several squatted cottages and strips of tilled land by the side. With scarcely a curve in the way, we are led to Newhouse Barton, where the road is stopped suddenly by a gate. But the track is not lost, for it leads clearly through three gates in line by the farm-house, and in the grass of the little field by the Am brook the hollow can be easily discerned which leads us to the fording-place. Having passed this, a fragment of hedge bars the way, but there is a wide opening in it exactly in line, and we are led out through another gate without change of direction in the old road for Staverton ford. At the point where the road crosses the little River Hems (or Hemps) is the boundary of three parishes – Staverton, Broadhempston, and Littlehempston – and the marking of a definite place on the road thus is interesting evidence of antiquity. At Staverton village is a slight turn, having its origin probably in a steep pitch of rock. Again, keeping direction, we are led towards the ancient bridge, but at Goulds the track passed through the orchard gate immediately before us, along what is now the field-road behind the house, and is just sufficiently raised on a natural bank above the marshland of the river. It was a matter of interest to find that observation on the spot was confirmed by study of the oldest maps. The road over the bridge and up to Huxham’s Cross above Dartington belongs, of course, to the bridge period. It is evident that an important through-traffic way passed here, since we find that this magnificent relic of mediaeval building, now five hundred years old, is but the successor of a bridge which had itself become ruinous by the lapse of years. The way, then, behind Goulds leads us to the ford – still accessible – a solid rocky bed giving a safe crossing of the swift Dart, save at such times as the river is in flood. The ford brings us over into a field still retaining the name of Rattery Old Lane, a striking instance of the permanence of name, as we may be sure that, the bridge having existed for many centuries, the fording-way has passed out of use. Directly up from the ford a gate leads us into Rattery Old Road, a grand specimen of an ancient way, boldly pressing up the long ridge past Rattery. The track is unbroken till the small stream Harbourne is crossed at Marley. Owing to the formation of the modern Exeter–Plymouth coach road we miss it for two hundred yards. It lies through the fields of Marley Farm and is again available as a little-used lane leading on to South Brent. Here, on the Brent Moor, it crosses the Avon and the Glaze brook (or Glas brook), passing the grounds of Glazebrook House to the hamlet of Wrangaton, keeping high on the foothills of the moor, in as purposeful a line as possible. It brings us to join the course of the present Plymouth road at Bittaford, and we have the line of old and new in one to Ivybridge, where we cross the Erme. At Torhill House the way is a parish boundary for a short distance. We pass Woodland and Cadeleigh to Lee Mill, where we cross the Yealm. The part from Avon to Yealm is prominently shown on the map of the Dartmoor Perambulation at Exeter. It passes to the north of the present main road till Smithaleigh is reached, and soon after has the old Saxon name of Ridgeway. This, and the fact of its being taken as a parish boundary, show its antiquity. Immediately after crossing the Plym at Longbridge, leaving the main road, which bears away to the left, we have an old lane immediately in front, passing up from the river marsh into Egg Buckland parish, and of it no less an Authority than the late Mr. R. N. Worth, F.G.S., says it is one of the finest instances of an ancient, deeply channelled Devonshire lane. Its name – ‘Saltash Lane’ – is sufficient evidence of its purpose. We follow it to the north of Widey, across the Plymouth–Tavistock road at Knackersknowle (Crownhill) to St. Budeaux, where it is again a parish boundary which we follow right down the hill towards the Saltash Ferry. It is lost in the fields in the very sight of that broad water of the West which bears the Celtic name – Ham Ouse. Thus reaching the western limit of the county we leave the old track to go on its line from the ferrying strand north of the railway bridge at Saltash, through Landrake to the mineral lands north of Liskeard and others also to the far west of the Cornish peninsula. Returning to the ford across the Teign, we may remark that the very extensive marshland for miles up the river would make this ford a most important one. On the northern shore of the estuary the Ordnance Survey marks a lane leading to the water – ‘Supposed British Road’, as on the south side. This passes through Ware Farm, and by looking over the wall from the Teignmouth road a well-marked fragment of road is seen with hedge on either side. Exactly across the road the ‘British’ way leads up the slopes of Little Haldon. Soon it is a well defined country lane, past the gate of Wood and by Ashwell Cross directing us over the heath at the summit table-land, and here its character – a rough flint track over the open – being perhaps its unchanged condition from the earliest days. For a very long distance it is the boundary of Dawlish parish. After a long, straight descent to Dawlish Water it reaches Gulliford, where an old road leads away at a marked angle to the settlement by the Exe we know as Exeter. This road is of great interest as well as being an ancient road almost out of use, yet it is a more recent way than the one we are following which leads to the ford of the Exe estuary. Through the lapse of ages and the enclosure of land the line is not so certain, but the gates through which we pass lead to an ancient boundary stone near Middle Duckaller Plantation and on to Cofford Mill, whence a long line of hedge brings us directly to the end of an old, deep lane of very marked character along the side of Easter Hill, above the extensive Cockwood Marsh. Following this past Staplake we curve eastward in half a mile to the strand of the Exe, precisely at the ferrying-place we know as Starcross. It must be remembered that the river has changed its course between its banks perhaps several times in the lapse of ages, also that the mouth of the river was by Langstone Point. The strand at Starcross suits neither Lympstone nor Exmouth, the reason being that it was the fording-place of a track which lay between those two places. Having reached the eastern bank we travel in a direct line along the boundary by Courtlands, along Summer Lane, past Point-in-View, having Backenhayes on left, where the hedge is a parish boundary, straight through Marley Woods, out on to Lympstone Common, where at the guide-post the track is again a boundary. There is an old track also by the side of the present road on Lympstone and Bicton Commons. We follow the road to Yettington – a boundary all the way – Hayes Barton being a short distance to right. At Yettington the road wanders slightly to Colaton Raleigh, where we are led into a road making for the ford of the Otter at Harpford. Now the great natural rampart which extends from the Blackdowns to the sea-coast at Sidmouth is to be faced. The way leads us up the winding track, Knapp’s Lane, which is, at the top, a boundary going along the east side of Fire Beacon Plantation, in direction north by east, to Hollow Head Cross. Several tracks converge into the old way at White Cross. So on to East Hill, with road and boundary by White Cross Plantation to Westgate Hill, where three parishes meet on the track. This great ridge is kept to in order to avoid the incredibly difficult country of the tributaries of the Axe and the Dorset country. The way appears to lead now into Combe Park, Road Wood Copse, and Beech Walk and past Combe Farm. * Boundaries on track total about nineteen miles. Brought thus to the Devon county boundary it remains but to remark that the old track appears to be in great part the London road, but not passing through Yeovil, and by one side of Sherborne, through Milborne Port, by one side of Shaftesbury, and up on the high chalk downs to where were formed the vast earthworks of Old Sarum. This line had to be taken to avoid the dense primaeval forest of Selwood, an almost impenetrable barrier, and of which Cranborne Chase is the southern remaining fragment. There are other ancient ways on the Wiltshire Downs, one of the most important passing Stonehenge, in a region full of Celtic or of even earlier remains. Ours, like it, led to Farnham by the fragment of old way, west of that town, still known as the Harrow (hoary, old) Road. Eastward from this point it is well known, and of late years has been accurately traced, being designated, since mediaeval times, The Pilgrims’ Way. Its course is along the southern slopes of the North Downs, keeping clear of the great forest the Andredsweald, near Guildford, Shere, Dorking, Reigate, Merstham, to Canterbury and the Straits of Dover. 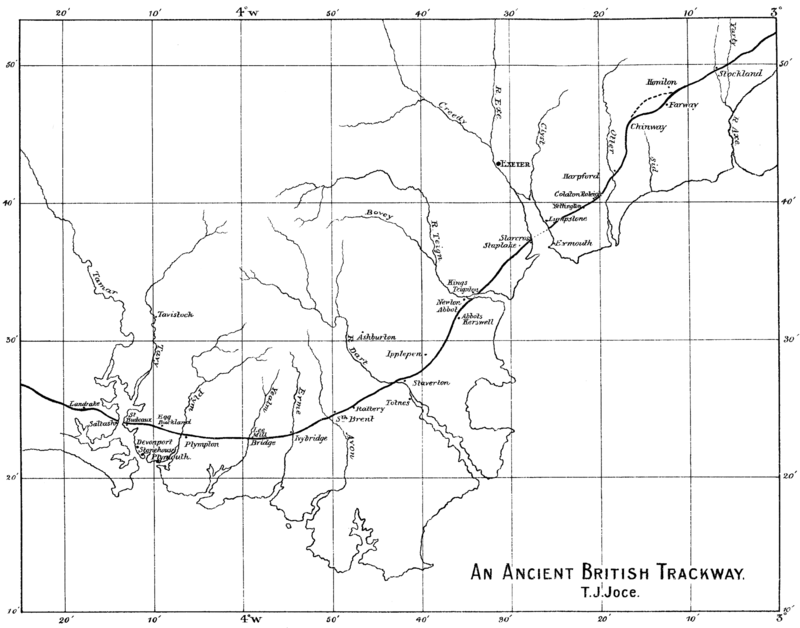 Antiquaries of the first rank acknowledge this to be a track dating from British times and even earlier. Recent discoveries have shown that there was, many centuries before the Christian era, a close connection between this island and the lands of the Aegean Sea, and it may well be that the bronze weapons and armour of many a classic combat were forged from the precious ores brought by long trains of packhorses from the distant western mines over the hills and dales of our own Fair Devon.